I didn't notice this article until today. The company also said today they believe the sinkhole could have been prevented, and claims two weeks ago they alerted the Department of Natural Resources of problems the well experienced in 2010 and 2011. "We had some comfort after that meeting that we didn't think we had, number one, a relationship to what was going on; and number two, the risk of anything happening as it occurred on Friday," Cartwright said. Remember, back in Jan. 2011, they admitted a breach out of the dome appeared possible and they asked for DNR guidance in developing a plan for continuous monitoring of the cavern. Surely they had been monitoring it for the past year? I wonder if they could have taken some of the brine out of the cavern prior to the collapse, if that would have prevented the sinkhole from happening? I wonder if they still think they could have prevented it? Thanks for the meeting summary. The frack-out info was interesting. If I understand correctly, the salt dome curves a bit inward, leaving the cavern really close to the dome edge. Mounting pressure on the outside of the dome wall built up so much pressure on the brine inside of the cavern, that the cavern wall fractured and the brine was forced out. The brine, oil and gas followed the dome wall because the rock formations are the weakest in that area. As the frack-out occurred, the bottom began filling in. This was done incrementally over a couple of months; the cavern is currently 3/4 filled with material and the top quarter is filled with brine. I'm still not sure what to make about the gas bubbling in the sinkhole. Seems kind of strange that it has just started; apparently a new pathway opened up below. That's a good question, mixin. I've read that the first line of defense when a gas cavern develops small cracks is to add more pressure to swell it and hopefully seal the cracks back up, but handling brine filled caverns could be different, especially dealing with a breach of the salt dome wall itself. Maybe it would have been better to do a controlled collapse by slowing removing the brine. I'm confused by Mr. Cartwright's quote now, because I would suspect the effect of the breach combined with being very close to the dome edge was why the cavern was so fragile, though I wondered if pressures on the dome edge had increased in the last couple of years for other reasons. Even though it does sound preferable to have the venting to the sinkhole, I wondered if more gas is either surging out of the deep strata, or possibly being released from salt in the cavern or dome itself due to pressure fracturing or water intrusion. I read that violent events called 'outbursts' releasing massive amounts of gas from salt can occur in mines. The largest and best-recorded of the small tremors occurred at 9:06 p.m. Tuesday and two more came back-to-back at 10:11 p.m. Wednesday, said Stephen Horton, researcher with the University of Memphis Center for Earthquake Research and Information. Horton said the current tremors are not a reason for concern nor do they appear to be an indication that they are leading to any major geological developments, such as the formation of another sinkhole. We now have the posters from the last meeting. to those who made it possible. Also included is a Base of Clay Map, Gas Isotope Results, Packer Swab ORW Development, Baski Well Development Packer, as well as a few others. Those are excellent graphics, mixin! Thank you very much for posting and from me, too, to Assumption Parish/DNR and Shaw Group. It looks like the Big Hum reservoir is being piped right up to the sinkhole via the frack-out, doesn't it? 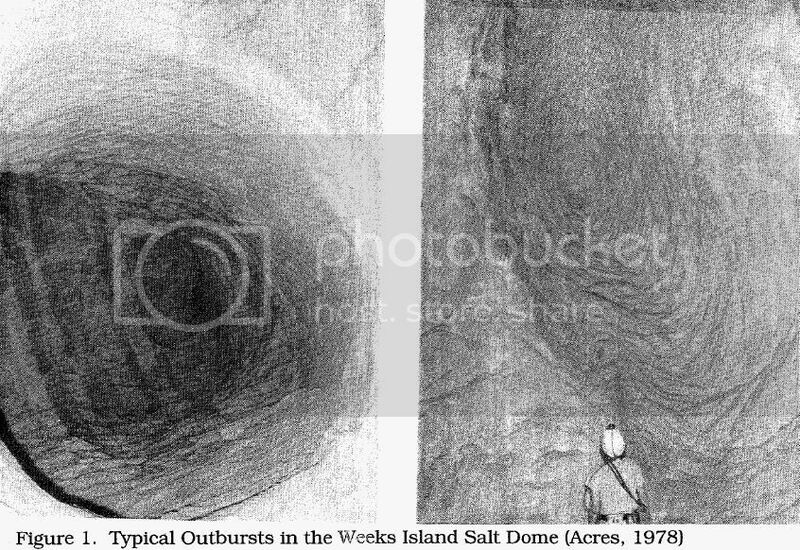 The unusual shape of the sinkhole reminded me of this article about gas releases from salt forming cornucopian-shaped holes hundreds of feet high. (Of course, that is dwarfed by the scope of this whole cavern blowout to the surface.) I've wondered if there are outbursts in what is left of the cavern causing the occasional sharp tremors. The occurrence of gas in salt mines and caverns has presented some serious problems to facility operators. Salt mines have long experienced sudden, usually unexpected expulsions of gas and salt from a production face, commonly known as outbursts. Outbursts can release over one million cubic feet of methane and fractured salt, and are responsible for the lives of numerous miners and explosions. Equipment, production time, and even entire mines have been lost due to outbursts. An outburst creates a cornucopian shaped hole that can reach heights of several hundred feet. Yes, it does. In the last meeting, the geologist speculated that the gas bubble sites that popped up months ago were the first warning signs of trouble. He thought the micro quakes were releasing those bubbles for many weeks until the final breach occurred. So the Big Hum reservoir almost had to be releasing gas prior to the cavern/dome cave-in. I just now realized that they believe the whole side of the salt dome in that cavern area is gone. Compare the approximate edge of salt in the before and after pics... in the after pic, see where they drew the line where the outside edge used to be? Apparently the frack-out caused that whole bumped-out part to fall off. 2. The testing of the Observation Well last Friday indicated the cavern floor had risen an additional 10 feet from the previous measurement on October 19. The cavern floor has come up approximately 52 feet since it was first measured on September 24. Additional measurements are planned for later this week. I think the helicorders are picking up the movement of debris into the cavern. It has been reported that a large slough in just occurred at the sinkhole site. The size is estimated to be a 20′ by 80′ section located on the east side of the sinkhole. No additional details are available at this time. Looking at the helicorders from noon today to present; the first two (#3 & #8) show us the action had pretty much stopped by 17:00 and has remained pretty quiet. The third one (#9) had action again a couple of hours later. ASCENSION PARISH,LA (FOX44) — Imagine going to grab a glass of water only to find out what's brewing inside the cup could burst into flames. High levels of arsenic and barium were found in his well water along with the methane. They told him to drink bottled water. BAYOU CORNE — Assumption Parish officials said a helicopter flight over a sinkhole east of the Bayou Corne community confirmed on Thursday their estimate of how much territory the slurry-filled hole swallowed Tuesday. But Texas Brine Co. officials defended Thursday their smaller estimate of the collapse zone as the more accurate figure. * Results from the sinkhole depth survey taken on October 30 indicate the maximum sinkhole depth is now at 170 feet versus 445 feet on October 4. A repeat sinkhole depth survey was conducted yesterday with results expected early next week. * Total depth measurement taken on Thursday indicated that the bottom of cavern #3 moved up approximately 13 feet since the last measurement on October 19. Here's an update on the status of recreational activities in the area from Mr. Landry. Dennis Landry, owner of the only boat launch in the area (the Sportsman’s Landing of Bayou Corne) and Cajun Cabins lodging, puts things in perspective for sportsmen. "I think that a lot of fishermen are still uncomfortable because of the bad publicity and press," Landry said. "But everything is still open. The bayous are open to the public, and patrolled regularly by the Assumption Parish Office of Emergency Planning and the Louisiana Department of Environmental Quality. "The boat ramp is still open, although parking is a little limited because of all the response vehicles. But, if you want to fish, I will find a place for you to park. Some cabin rentals are still available, too. More details at the link and there's a phone contact for Mr. Landry in the article. BATON ROUGE – Louisiana Commissioner of Conservation James Welsh today announced that the Office of Conservation will be coordinating with the state Department of Environmental Quality (DEQ) in seeking permission from property owners to do additional monitoring of Bayou Corne community homes to test for the accumulation of methane believed to be connected to the failure of Texas Brine’s cavern. Although previous in-structure testing done by DEQ experts on the ground showed there were no natural gas accumulations in the structures tested, further testing will be conducted out of an abundance of caution to ensure public safety. Welsh said the action is being taken in response to analysis and review of data provided by the network of 18 shallow monitoring wells the Office of Conservation instructed its contracted agent, Shaw Environmental and Infrastructure, to install in and around the community. These wells are part of the ongoing overall Office of Conservation response to formation of the nearby sinkhole and ongoing presence of natural gas underground and bubbling to the surface connected to the failure of Texas Brine’s abandoned brine cavern on the western side of the Napoleonville Salt Dome. That monitoring-well network has detected underground natural gas at low pressure in an area shallower than the primary aquifer, which indicates a need for additional tests to look for potential presence of natural gas in structures built directly on the ground surface. For homes and structures built on supports that make space between the base of the building and the ground surface, natural air flow prevents interior accumulation of natural gas. Welsh said that while the Office of Conservation will continue to take immediate actions as needed to protect public safety, the Office will also continue to hold Texas Brine LLC accountable to meet the requirements of his previously issued orders to develop monitoring systems, install vent wells and take other actions to remediate the effects of the company’s failed brine cavern and assess and abate threats to public safety and the environment. Welsh said that the Office of Conservation and DEQ had already acted to assess conditions in and below the community to determine what future actions were warranted, with Conservation’s having instructed Shaw E&I to install the initial monitoring-well network and having ordered Texas Brine to continue to install more; and with DEQ having offered in-home testing to Bayou Corne residents who requested it, in addition to the agency’s ongoing air and water testing in the area. Determining whether natural gas is present in structures built directly on ground surface is one step in the process of assessing the potential impact to the community and achieving a return to normalcy for the community. The next step will be based on what is found through the in-structure sweep and ongoing monitoring and analysis of existing and future shallow monitoring-wells. They were flaring 39,000 cubic feet per day at the time and planned to go nonstop. But I think I read in one of the articles about the recent tremor and sloughing that the bubbling from the sinkhole itself stopped after those events. If that is true, then a venting pathway was lost at that point. I was wondering if that would cause more gas pressure elsewhere. The Advocate article also reports that the sinkhole was larger in volume after the latest collapse, even though it's shallower. See text for dimensions and details about how Texas Brine got gas to flow for venting.